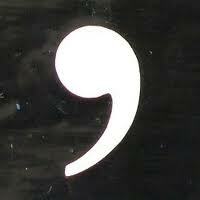 If you had the chance to take a contract out on one punctuation mark, most people would probably choose the comma. Unfortunately, that’s not possible although modern journalists are doing their best to make it into an optional extra! Lists are the obvious example of using a comma. In the old days, people used to use what’s called an ‘Oxford comma’ before the word ‘and’, but we don’t any more, eg ‘I went to the market and bought apples, pears and bananas’. There are some circumstances when using the Oxford comma makes the sense of the text clearer, but most people would agree that you don’t need it. The list may also be a list of adjectives before a noun, eg ‘It was a juicy, ripe, delicious peach’. Conjunctions (or connectives) make two sentences into one ‘compound’ or ‘complex’ sentence with two separate clauses. ‘Coordinating conjunctions‘ are used to make a ‘compound’ sentence when the clauses are equally important, and the two ‘main clauses’ should always be separated by a comma, eg ‘The sun was warm, but it was cooler in the shade’. There is a useful way of remembering the coordinating conjunctions, which is to use ‘FANBOYS’. This consists of the first letter of ‘for’, ‘and’, ‘nor’, ‘but’, ‘or’, ‘yet’ and ‘so’. ‘Subordinating conjunctions‘ are used to make a ‘complex’ sentence when there is a main clause and a subordinate clause. (Subordinate just means less important.) If the sentence starts with a subordinating conjunction, the clauses need a comma between them, eg ‘Even though it was very hot, he wasn’t thirsty’. However, if the subordinate clause comes at the end, there is no need for a comma, eg ‘He wasn’t thirsty even though it was very hot’. There are lots of subordinating conjunctions, such as ‘after’, ‘although’ and ‘because’, but the easy way to remember it is to ask yourself if the conjunction is in FANBOYS. If it is, it’s a coordinating conjunction; if it’s not, it’s a subordinating conjunction. Which (but not that) needs a comma before it when used as a relative pronoun, eg ‘The sky, which was tinged with orange, was getting darker before sunset’ or ‘He looked up at the sky, which was tinged with orange’. If you don’t know whether to use which or that, the word ‘which’ describes something, whereas the word ‘that’ defines it. The rule about commas also applies to ‘who’ when it comes to describing people, although you still use the same word whether you’re defining or describing someone. Relative pronouns such as ‘which’, ‘that’ and ‘who’ all create a relative clause, which is a type of subordinate clause, so the sentence will be a complex sentence. Openers are a useful way of starting a sentence, usually in order to specify a particular time or place, eg ‘At half-past three, we go home to tea’ or ‘At the end of the road, there is a chip shop’. The subject of the sentence (ie the noun or pronoun that governs the verb in the main clause) should come first. If it doesn’t, you should put a comma after whatever comes in front of it. Numbers need commas to separate each power of a thousand. Start on the right at the decimal point and work left, simply adding a comma after every three digits, eg 123,456,789.0. This entry was posted in English, Teaching and tagged 11+, 13+, comma, commas, English, punctuation on March 28, 2013 by Nick Dale.